Add style to your slatwall with Single Hat Rack for Slatwall displays. This option is ideal for displaying hats in your store and attracting shoppers. They allow hats and caps to stand out instead of being hidden by distracting display mediums and other merchandise. 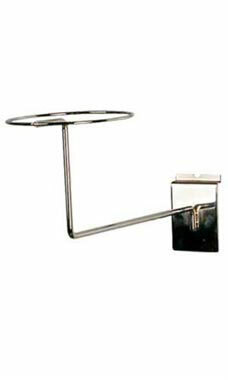 All Single Hat Rack for Slatwall displays are in stock and available for immediate delivery. These items work great for stuffed animals as well as for hats. These make those special hats stand out even more by displaying them on this rack. These Hat Racks are great. They are the perfect highth and distance from the wall for all of our hats. Also works great for climbing, biking, skating helmets and of course makes perfect hat displays too. I REALLY LOVE THESE HAT HOLDERS! I HAVE A WALL IN MY RETAIL STORE WITH OVER 80 HATS ON IT AND HAVE ORDERED THESE AND AM SO GLAD I DID. Worked well to display a variety of hat styles. These things are great and are just what my store needed for my hat displays! Adds dimension to the slat wall with the addition of hats. A good hat rack. Solidly built and attractive. We are using some of these to display scarves as well, works great. Adds just the right touch to a hat display, depth!